We’d love your help. Let us know what’s wrong with this preview of Star Wars by Simon Beecroft. Star Wars: The Clone Wars: Yoda in Action! DK's Star Wars Readers help kids learn to read while enjoying the stories and characters from the blockbuster movies. 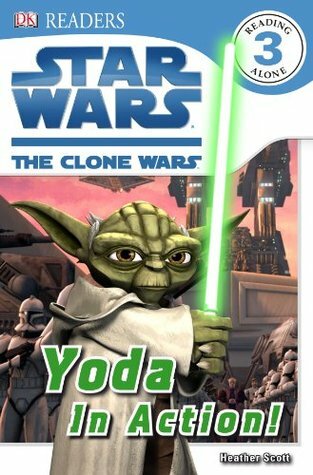 In Yoda in Action!, join Jedi Master Yoda as he battles villains and evil droids in the adventurous Clone Wars. Packed with full-color photographs and engaging, age-appropriate stories, the ebooks introduce young children to a life-long love of reading. These amazing stories are guaranteed to capture children's interest while developing their reading skills. They're also perfect for reading together! This is also a tv episode for the clone wars show. I'm torn between "this is too action driven" and "this has too many made up words" and "the educational snippets are too far and few". this was a more violent Yoda than i am accustomed to. I'm sure emerging readers will enjoy this, but I'm not sure I'd recommend it for them. Tales of Yoda fighting in the Clone Wars. For kids who love Star Wars and are at a lower reading level or are reluctant readers, this is probably perfect. However, to me it read like an outline for a good story. The writing was extremely simple. And while I understand it's for young readers, there are pictures books for kindergartners that are short and to the point but still manage to be engaging. But if this gets a kid interested in a reading, I say go right ahead. My nine year old daughter, a very reluctant reader, really likes the DK Star Wars books. She loves all things Star Wars, and so she is willing to read these books about her favorite stories and characters. The stories are simple and enjoyable, the illustrations are nicely done, and the books are interesting even at the lower reading levels. My 10-yr-old son read this: "I am glad that Yoda saved it and that's it." I liked this book because it has a lot of new details about yada that I didn't know before. Quick and fun read about an adventure of Yoda. It's fun to try to read it out loud in a Grover voice.